Do you remember Imelda Marcos? Girl of my dreams, because we shared a shoe fetish. Shoes and more shoes, I must have shoes until they fill my closet. But did you know shoes can die? Oh, they don’t share that information with many owners. Perhaps this is known only to Imelda and myself. Like their owners, they begin life with great promise smelling leather wonderful, perfect skin, and often bright and shiny. Shoes make their appearance like a set of identical twins, looking alike at first glance. If you study them carefully you will notice they are just like real human twins. They have some really significant differences. One is politically left and the other right. Picture boxes lined up in Al Bundy’s shoe store. Some of the shoes chosen friends are honored to be placed on display knowing very well they will live a life of celibacy. Most will likely never be selected by any shopper. Traditionally shoes have been made out of leather,wood or canvas. Since 2010, shoes have been increasingly made out of rubber, plastics or other petrochemically derived materials. All these man-made shoe products are determined to make your feet sweat, and the shoes smell bad. You may ask, ‘Why do we buy shoes?’ Well, there are many good reasons. They protect our feet from the dangers of work, home and forest. The human foot is vulnerable to environmental hazards such as sharp rocks, broken bottles, hot ground, and falling debris. Some shoes are born to be specialist in sports like hockey skates, football shoes, and running sneakers. There is a hierarchy within some of these special foot coverings. If they make you jump higher, run faster, or just feel more important, you know, special, they demand a higher salary. Some of their birth mothers actually gain importance by placing their name on the shoes, like Nike, New Balance, Converse, Stuart Weitzman Diamond Dream Stilettos, and House of Harry Winston’s “Ruby Slippers”. shoes with tassels from 1960, 1970, and 1980 carefully stretched with shoe trees to keep their form should a turn of history cause a return my feet to the classroom. Oh, there are moccasins, 1960s sandals Ben-Hur would have worn in the Roman Colosseum, a variety of sneakers, one pair with wheels on the side for car show attendance, and water shoes. My interest in this shoe collection is rapidly fading as the toll Marine Corps marching, ski school teaching, and the ugliness of aging has exacted on what was once a beautiful pair of feet. Now I am more interested in how comfortable footwear is for those days when I now consider ‘excessive’ walking is required. Crocks, a trade mark shoe looking like they would fit a duck, seem to be the most comfortable. Better yet, they are an improved choice over Velcro closed sneakers so many geezers choose to wear. With Crocks, I don’t even have to bend over to put them on. Bending over has become a form of miserable exercise. Now I slide into the day’s footwear. You can imagine how all those wonderful, memorable shoes in my closet feel since I have chosen Crocks as my daily footwear. They are crushed. I think some have considered suicide. Several mornings when I open the closet’s folding door there is a shoe stuck in the bi-fold, crushed, bent beyond further use. Several dust bunnies escape my museum of shoes each day. They are unwilling to endure the smell of old shoe feet any longer. It was time to have a serious talk with my shoe collection, so I sat on the floor before the closet to explain why some of them had to go. Go? But where? Just like us humans, when we are no longer useful or needed, a bit shopworn, tired looking, and down in the heels, we are sent to the ‘home’. I explained all this to the shoes gathered before me as I picked up each pair remembering the years of joy and service they provided for me. I bagged each pair with loving care. Only those who have unexplainable collections will understand this emotion. As I was digging through the shoe pile looking for a missing shoe mate I know it was a relief to shoe held in my hand when its partner was found. You see, if I could not find both shoes to make a pair, the single shoe knew footwear life as they knew it was over. Burial in the wheeled container set out by the road was a certainty for a single shoe. Two plastic trash bags were placed on the floor by the closet door, one white and one black. When the selection was over there was a plethora of shoes, still residing in the closet, waiting for the day when Crocks were ignored and some lucky shoe pair would get to travel in the outside world. 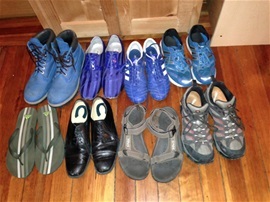 As for the shoes in the white bag, the Salvation Army box said, ‘clothes only’. I put the shoe bag in there anyway. Shoes are clothes for the feet! Yes, there was a moment of silence when the black bag reached its final destination. Now I have no pile of shoes in the closet. Shoe shopping time.